"Laenna O'Donnell peered into the green glow of her starlight scope. At the far end of the empty corridor she could make out tiny numbers winking on and off as the elevator made its way up. She leaned back into the office and raised a clenched fist: the danger signal. In the glow of the computer terminal Michael urgently held up three fingers: there were still three files being downloaded. Raleigh and Arron were ready by at the window -- the rappel line was secure, and they could make their escape within seconds, once Michael had the data they needed on disk. They were a BlackEagle cell -- a team of professionals working for a company with a worldwide reputation forgetting any job done, no questions asked. Their client needed evidence of an illegal arms deal between a major corporation and FARC, the Colombian insurgency. The data was off-line -- kept on a computer unreachable through the networks so the only way to get it was to come in after it. The security was formidable, but with careful planning and perfect execution, they had defeated it. That was the kind of thing BlackEagle operatives did -- a fact reflected in their fees. Laenna looked back down the hallway and watched the numbers blink. Then the elevator got to their floor, and the blinking stopped. They had spent days studying the security, and had gone to great lengths to get in and out undetected. They had avoided cameras, motion sensors, and heavily armed guards -- but they must have missed something. Laenna flipped the safety off her silenced Beretta..." ...from the 1st edition Millennium's End rulebook. 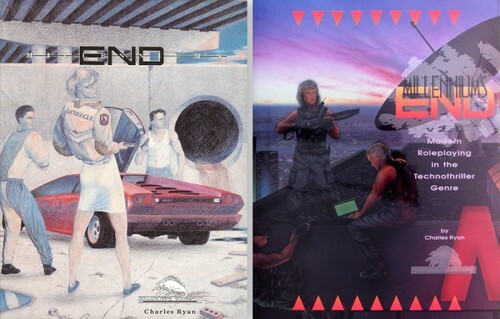 Now-defunct Chameleon Eclectic (which also introduced The Babylon Project, a Babylon 5 RPG) developed Millennium's End, a post-Cold War RPG. Writer Charles Ryan (who also illustrates) mated an excellent rules set with a "Slump America" background. I can't speak highly enough of the games and its supplements. Realistic, detailed, and very interesting. The rules set handles combat in the most realistic fashion I've ever seen in a RPG, yet is eminently playable. Even if the background is a little dated, the rules set could be extracted for use elsewhere. 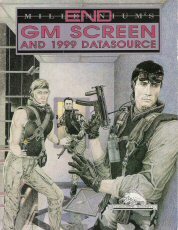 A useful companion game would be Twilight: 2000, particularly the Merc: 2000 campaign book and related accessories. It's two in the morning. The office is forty stories up, high above the sirens, the gunshots, the cries of pain and anguish that are the city at	night. Michael is bathed in the glow of his laptop, typing furiously as he navigates the labyrinthine directories of the corporate mainframe. In the pale light of the doorway, Laenna's silhouette stirs. "Someone's on the elevator,"comes her whisper over the radio headset. "No way," Raleigh answers from across the room. "I've got the building control routine up. Elevators are dead." "Come see for yourself," Laenna replies. Sure enough, through the green glow of starlight goggles the tiny numbers blink brightly as the elevator ascends. "We've got a problem," Michael interjects. "The files aren't here. Sawada lied to us." He turns in the glow of the monitor. "Door lockouts are coming up all over the floor." 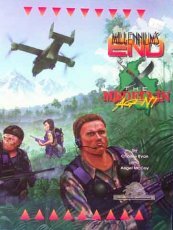 "Millennium's End is a roleplaying system set in a dark and dangerous future just a few short years away -- if not already here. It's a fast-paced contemporary adventure based on today's serious techno-thriller fiction and movies. Characters carry out investigations, espionage, and paramilitary operations with the most modern, high-tech equipment and resources available. The rules are detailed and cover skill use, vehicle chases, computer hacking, combat and damage with revolutionary systems. 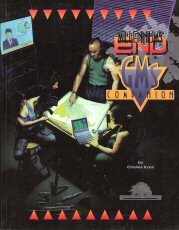 Loaded with supplementary information on technology, society, and post-Cold War global politics, Millennium's End contains a complete campaign and a ready to play adventure." 1. The Wake of the Sagittarian: Alexander Vilee is a shady Miami arms merchant who hasn't always operated to the letter of the law. Now Customs is taking a close look at his business, starting with his next shipment. Villee needs to get the cargo off the ship before it comes in to port. It's a tricky assignment, in an area of intense drug interdiction surveillance, and he's come to the only people who can pull it off. 2. Nightwalker: The CA-213 Nightwalker is 975 kg of steel muscle, composite armor skin and neural microcircuitry brains -- the cutting edge of robotics and military technology. Two weeks before the start of Defense Department evaluations, it's been stolen in a daring and professional raid on a corporate development facility. A trail of bodies leads halfway across the country, and straight into the middle of a major FBI investigation. The client wants the Nightwalker back before the government finds out it's gone, but the Feds are closing their trap -- and the operatives are in the middle of it. 3. 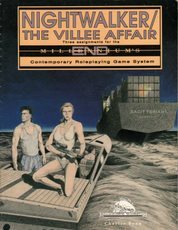 The Villee Affair: Villee is back, and he's in trouble again. Two of his associates have disappeared, a week before all three are due to go to court. What begins as a routine missing-persons assignment explodes into an international race in this affair of blackmail, murder, and double-cross. Plus: Pages of player maps and handouts, new body maps, and an article on urban law enforcement." "Neo-Nazis fire antitank rockets at Equal Opportunity Commission in Washington. The military junta in Japan tells the world that it will restore civilian government -- once the subversives and rioters are subdued. European Community bombers and paratroopers strike a terrorist center in Sudan, while the beleaguered South African government combats a corporation that has annexed 800 square miles of desert -- and four major diamond mines. And in San Francisco, a packed commuter train is locked in a tunnel eighty feet under the bay -- by techno-terrorists working from another continent. * An 11 by 32 inch screen that puts all of the tables and charts needed for combat, damage resolution, and vehicle use in one handy place. * A 32 page sourcebook with detailed calendar of news events, a bunch of NPCs described in detail and accompanied with complete stats, new operative and NPC character sheets, new equipment descriptions and prices, stats on dozens of vehincles and over 50 weapons not covered in the rulebook, and much more. * An 11" by 17" laminated card with body maps -- over 30 in total." 1. The Tactics and Investigations Handbook covers the how-to's of infiltrating high-security office blocks, conducting jungle operations, interrogating informants, and negotiating the streets, plus hundreds of other points for investigations and tactical operations. 2. 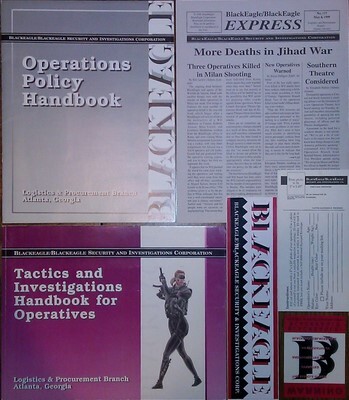 The Operations Policy Handbook covers BlackEagle company policy on operations, contracts, support, and troubleshoots in the rocky, post-Cold-War world. That's not all. The Kit includes an Operative ID Card, BlackEagle company newsletter, and a bumper sticker. Everything you need to be a part of the world's foremost security and investigations organization. Join the elite and prepare yourself for the most challenging and exciting contemporary and near-future adventuring around." 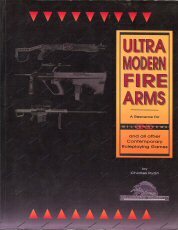 Ultramodern Firearms is the most complete reference on firearms available for any game. Dispensing with endless pages of tables and reams of figures, Ultramodern Firearms was written for you — the gamer, not the gun enthusiast. The text is clear, well organized, and easy to use, focusing on the features, advantages, and uses of over 300 weapons and sights. 200 accurate, clear illustrations let you see what you're reading about. • 200+ entries cover almost 300 of the most modern weapons and variants in use today. Scopes, laser sights, and night-vision devices are also covered in detail. • A features index lets you outfit your character or NPCs with the ideal weapons by looking up the features they need. Find the weapon you want, even if you don’t know what it is. • A listing of more than fifty military, police, and special-operations organizations lets you know what weapons, are used by the world's elite forces. • Useful text introductions discuss history, development, and use of each class of weapons. • Complete Millennium's End game statistics are covered for more than 250. firearms. 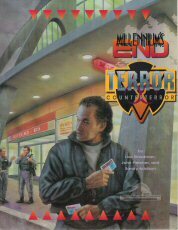 For Millennium's End or any other game system, Ultramodern Firearms is an invaluable resource for players and GMs alike." "It's lonely at the top. 6:48. Your players will be here in twelve minutes. You still haven't mapped out that terrorist training camp or thought up a name for your primary NPC. A good Millennium's End assignment needs so many details — and you've got so little time! The GMs Companion has what you need, whether you're running adventures on the fly or just want to cut out a few hours of pre-game prep. Location maps, NPCs, computer net layouts, organizational charts, creative GMing tips and in-depth adventure seeds will energize your campaign while taking some of the work out of being the GM. • Twenty pages of GMing advice offer dozens of specific tips for managing game events and pacing, manipulating your players, building unique and memorable NPCs and settings, and turning your adventures and vision of the Millennium's End world into a cohesive, dynamic campaign that will enthrall and inspire your players. • Fifty pages of detailed location maps prepare you for any contingency. Whether your operatives blunder into a convenience store holdup or are planing a major assault on a cult compound, you'll never be caught short for a detailed, fleshed-out, well-described setting. • Dozens of fully-described non-player characters and NPC stereotypes give you the personalities and stats you need to populate your gaming sessions. From gangsters on the street to BlackEagle Miami's Senior Cell Leader, there's a full spectrum of NPCs to fill almost any kind of role. And there's lots more. Need a name for a minor informant? Want to know the street slang for an undercover cop? Wonder who the Executive Vice President for Security at a multinational corporation reports to, or what rank the commander of an infantry company holds? It's in here. For reference, resources, and good advice, the GMs Companion is the ultimate tool for the busy GM." The roar of jet turbines gives way to the din of jungle insects as the Colombian army VH-22 disappears over the trees. We're alone now, on the sweltering slopes of the Cordillera Occidental, fifty klicks behind FARC lines. And ten klicks from, the crash site -- an F-23 downed over enemy territory. The CIA didn't tell us what it had been up to -- probably didn't tell congress either -- but whatever it was, we can bet we're not the only one looking for the wreck. The tenor of the forest noise changes just as Josh's arm snaps into the danger signal. At first there's nothing, just the drip of sweat running off my brow as I crouch, frozen. Then comes the muttered sound of Spanish voices, and Josh slowly signaling "enemy in sight." Damn. Not 200 meters off the LZ and we hit a patrol. It's going to be a long day. "After decades of struggle against minor guerrilla groups, in 1999 Colombia faces an all-out war against the heavily-armed, insanely aggressive drug lords of the Medellin Cartel. A political agenda is no longer a necessary part of the insurrection — in the dark and brutal world of Millennium's End, greed and criminality are just as legitimate reasons to overthrow an government. So as an indifferent world watches, Colombia struggles against increasingly difficult odds of survival — making for plenty of work for a BlackEagle cell. The Medellin Agent is a complete sourcebook on this bloody war, covering Colombia's geography and history as well as the forces and agendas on either side of the battle lines. Also included is a complete adventure set in the heart or war-torn Colombia." Miami. The Red Zone. Tonight, only two things are certain. Somewhere in these few square kilometers, people are going to die. No one will be there to help -- not the police, not the paramedics. Only the gangs, the insane, and the very, very dangerous. "Police response unavailable beyond this point" warn the battered signs along 20th Street. Crouching in the shadows just past one such sign, Pierce watches the green-grey glow of distant trashcan fires through his night-vision goggles. A siren cries along I-95, while somewhere ahead a muffled gunshot rings out, followed by two others. Pierce glances back to the shadowed forms of his companions, checks the safety on his MP5 one more time, then starts off into the darkness. The Red Zone might not be his favorite part of town, but it's where their client has sent them. And for a Miami BlackEagle cell, a client is a client, business is business, and the Red Zone is just part of the landscape. "Miami. A city of tropical delights, of exotic atmosphere, of speedboats, pink flamingos, and pastel beach hotels. But more than anything else, a city at the seam of commerce and crime. Whether they're corporate officals in gleaming bank towers or black-market weapons dealers in sleazy bars -- well-dressed mob bosses in Coconut Grove restaurants or cocaine cowboys in Ferrarri Testarossas -- the players may look different, but the game is the same. Gateway to the Caribbean, banking center for Latin America, and entry point for half the drugs inthe U.S., Miami is where business shows its underside -- and where there's always something to keep a BlackEagle cell busy." The drab canvas of the North Korean army tent flaps in the wind as the dark-haired man carefully packs C-4 into a gutted teddy bear. A grandson of the Kurdish diaspora, he'll make sure this toy gets into the hand of a Turkish child. Meanwhile, half the world away, a clean-cut French banker hands a briefcase to a hunched Canadian Army veteran in a crowded London pub. His corporation's support will be remembered when Quebec is an independent nation. In a desert camp in Sudan, a young Japanese woman storms a derelict jetliner, firing rapidly into the lifeless effigies of passengers and crew under the watchful eye of a Syrian instructor. And in Algiers, two technicians in a basement laboratory carefully maneuver a six-kilo plutonium pit into a weapon that may soon level an American city. "At every moment, on every continent, in every country, terrorist are at work. In a world on the brink of collapse -- a world of decaying infrastructure, overburdened police forces, bush wars, famine, and impending environmental cataclysm -- the price for getting a story on cable news is often measured in body counts. From Abu Nidal to the ETA, from the Afrikaner Resistance Front to the Worldwide Islamic Jihad, this book is the complete guide to the treacherous underworld of terrorism. Fifteen terrorist organizations (and six counterterrorist agencies) are covered in painstaking detail, with hundreds more outlined and ready for use in your campaign Maps, NPCs, tactics, weapons of mass destruction and many more resources make this the ultimate source on terrorist adversaries and adventure material for Millennium's End or any modern or near-future roleplaying game." Searching for a comprehensive guide to cars, motorcycles, helicopters, airplanes, boats, tanks and more? Look no further! 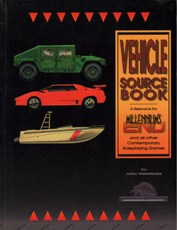 The Vehicle Sourcebook is the most complete gaming reference to the top-of-the-line modern vehicles on the road, in the air, and over the water. Covering hundreds of civilian and military vehicles, the Vehicle Sourcbook includes concise descriptions, real-world statistics, and accurate and detailed illustrations — because we all know how important looks can be when choosing your ride! • Ten chapters cover over 150 vehicles and hundreds of variants, from motor scooters to stealth fighters and everything in between — with an emphasis on vehicles that might commonly be used and encountered by player characters. • A features index makes it easy to pick the ideal vehicle for your character, cell, or NPC, even if you're not sure what you're looking for. Just select the features you want to find the vehicle perfect for your needs! • Useful real-world statistics are included for each entry, along with complete Millennium's End game stats. • Interesting and topical chapter introductions discuss the workings, advantages, and limitations of each vehicle class, in a straightforward and useful manner. 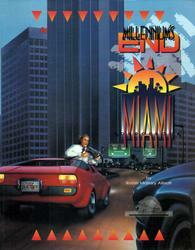 Millennium's End was a registered trademark of Chameleon Eclectic.